With Sinisa Mihajlovic being sacked and Delio Rossi being appointed coach, Fiorentina are truly a team in transition. It’s not as if they are bringing an unknown group of players to the pitch on Saturday or anything. But sometimes when a new coach takes over, it almost seems like a brand new team. Between the tactical unknowns and playing at home, they certainly have the upper hand as far as knowing what to expect. So we must be prepared for the Viola surprise. 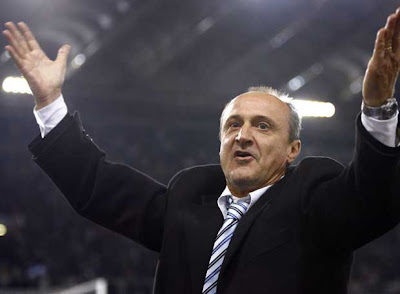 The big news being Delio Rossi, let’s start there. After four years at Lazio Under Claudio Lotito, and two different stints at Palermo in two years under Maurizio Zamparini, Rossi must be very excited to be appointed to a club with owners who aren’t one step away from a straitjacket. He’s a well known and well respected coach, I expect him to do very well with the squad at his disposal, just hopefully not on Saturday. The squad at his disposal is full of talent. Here are the knowns: Stevan Jovetic, who has 5 goals and 2 assists in 10 matches is proving his worth again this season after coming back from a terrible knee injury that kept him sidelined last season. Also up front is a familiar face in Alberto Gilardino. Seems like he saved all of his scoring for after he left Milan, as he as been the talisman and often the savior for Fiorentina. Even with only 4 starts this season, he has 2 goals, and I’m sure he wouldn’t mind scoring against his former club. And don’t forget Alessio Cerci, who’s netted 3 goals in 8 appearances, too. Let's hope he can't score against Milan, either. The midfield boasts one Juan Vargas, who has 3 goals in 4 matches and 3 assists and is thus a darling of transfer rumors these days. Another midfielder who many are hoping will be in the Red and Black come January is Ricardo Montolivo. He can be hot and cold in his performances, but if he is in fact hoping to come to Milan, this would be a nice audition for him. And don’t forget Valon Behrami and Houssine Kharja, who with only an assist apiece on the stat sheet are usually much more than that on the pitch. Palermo let go of several of their jewels this season, and one of those jewels was Mattia Cassani. The right back is considered one of the best in Italy and can cause problems offensively and defensively. Along with stalwarts Alessandro Gambarini, Cesare Natali, and Lorenzo De Silvestri, they can be a tough backline to crack. And their net is guarded by the very talented Polish keeper, Artur Boruc. I didn’t know how they would ever replace Sebastian Frey, but Boruc has done a great job filling Wolverine’s shoes. For Milan, we have some good news in attack in that Pato is back from injury. Also, Pippo played 90+ minutes in a Primavera match over the break to prove his match fitness, so I am hopeful he will get more than 10 minutes in this match, especially with the Barca match midweek that he is not eligible to play in. And with El Shaarawy doing well in his cameos thus far and also not eligible to play vs. Barca, Allegri has plenty of options in addition to the incomparable Ibra up front despite missing Cassano. What la Viola's defense will see after he's put the ball in the net. I am admittedly very poor at predicting what Allegri will do. Sure, maybe he should rest some players for the Barca match. But we are on a 5 game winning streak in the league, and this is an important match. Often, clubs with new coaches mid season will win their first match as a welcome gift for the new coach. I’m sure Allegri would prefer to give Rossi the welcome gift instead, showing the elder Rossi what a title winning manager’s team looks like.